Not to be confused with drinking cups, "cup" serving sizes, or measuring cups, which do not necessarily correspond with this unit. The cup currently used in the United States for nutrition labelling is defined in United States law as 240 mL. A customary "cup" of coffee in the U.S. is usually defined as 4 fluid ounces, brewed using 5 fluid ounces of water. 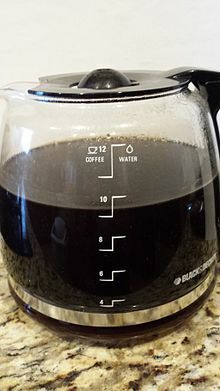 Coffee carafes used with drip coffee makers, such as Black and Decker models, have markings for both water and brewed coffee, since the carafe is also used for measuring water prior to brewing. A 12-cup carafe, for example, has markings for 4, 6, 8, 10, and 12 cups of water or coffee, which correspond to 20, 30, 40, 50, and 60 fluid ounces of water or 16, 24, 32, 40, and 48 fluid ounces of brewed coffee, respectively, the difference being the volume lost to evaporation during brewing. Australia, Canada, New Zealand, and some other members of the Commonwealth of Nations—being former British colonies that have since metricated—employ a "metric cup" of 250 millilitres. Although derived from the metric system, it is not an SI unit. A "coffee cup" is 1.5 dL or 150 millilitres or 5.07 US customary fluid ounces, and is occasionally used in recipes. It is also used in the US to specify coffeemaker sizes (what can be referred to as a Tasse à café). A "12-cup" US coffeemaker makes 57.6 US customary fluid ounces of coffee, or 6.8 metric cups of coffee. In older recipes cup may mean "coffee cup". Canada now usually employs the metric cup of 250 mL but its conventional cup was somewhat smaller than both American and imperial units. In the United Kingdom the standard cup was set at 10 imperial fluid ounces, or half an imperial pint. The cup was rarely used in practice, as historically most kitchens tended to be equipped with scales and ingredients were measured by weight, rather than volume. Similar units in other languages and cultures are sometimes translated "cup", usually with various values around ​1⁄5 to ​1⁄4 of a liter. In Latin America, the amount of a "cup" (Spanish: taza or vaso) varies from country to country, with some intending 200 mL, others 250 mL, and still others the US legal or customary amount. The traditional Japanese unit equated with a "cup" size is the gō, legally equated with 2401/13310 liters (≈180.4 mL) in 1891. It is still used for reckoning amounts of rice and sake. Separately, the Japanese standardized a "cup" defined as 200 mL. Traditional Russian measurement system included two cup sizes, one of which, "charka" (cup proper), was usually used for alcoholic drinks and measured 123 mL or 4.16 US fl. oz., while another, "stakan" ("glass") was twice of that or 246 mL/8.32 fl.oz. and used for other liquids. Since metrication, the charka was informally redefined as 100 mL, acquiring a new name of "stopka" (from the Russian word for 100, "sto"), while there are currently two widely used glass sizes of 250 and 200 mL. In Europe, recipes normally weigh non-liquid ingredients in grams rather than measuring volume. For example, where an American recipe might specify "1 cup of sugar and 2 cups of milk", a European recipe might specify "200 g sugar and 500 ml of milk" (or 0.5 litre or 5 decilitres). A precise conversion between the two measures takes into account the density of the ingredients, and some recipes specify both weight and volume to facilitate this conversion. 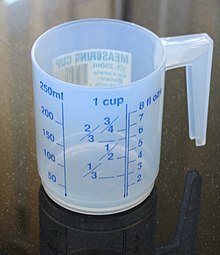 Many European measuring cups have markings that indicate the weight of common ingredients for a given volume. ^ One gram per millilitre is very close to one avoirdupois ounce per fluid ounce: 1 g/ml ≈ 1.002 av oz/imp fl oz This is not a numerical coincidence, but comes from the original definition of the kilogram as the mass of one litre of water, and the imperial gallon as the volume occupied by ten avoirdupois pounds of water. The slight difference is due to water at 4 °C (39 °F) being used for the kilogram, and at 62 °F (17 °C) for the imperial gallon. The U.S. fluid ounce is slightly larger. 1 g/ml ≈ 1.043 av oz/U.S. fl oz. ^ The density of water ranges from about 0.96 to 1.00 g/ml dependent on temperature and pressure. The table above assumes a temperature range 0–30 °C (32–86 °F). The variation is too small to make any difference in cooking. ^ Since an imperial cup of water weighs approximately 10 avoirdupois ounces and five imperial cups are approximately equal to six U.S. cups, one U.S. cup of water weighs approximately 8​1⁄3 avoirdupois ounces. ^ "Black and Decker Replacement Carafe". Retrieved 2016-12-30. ^ "Standard Australian Cooking Measurements". Retrieved 2014-09-24. ^ "coherent units". BIPM. Retrieved 2014-05-26. ^ "How Many Tablespoons in a Cup - Easy Conversions". First Health Mag. 2016-04-28. Retrieved 2016-05-08. ^ 1 g/ml is a good rough guide for water-based liquids such as milk (the density of milk is about 1.03–1.04 g/ml). ^ Ma, Allen (2007). Elert, Glenn (ed.). "Density of water". The Physics Factbook. Retrieved 2018-07-06. ^ a b c L. Fulton, E. Matthews, C. Davis: Average weight of a measured cup of various foods. Home Economics Research Report No. 41, Agricultural Research Service, United States Department of Agriculture, Washington, DC, 1977. This page was last edited on 23 April 2019, at 18:38 (UTC).